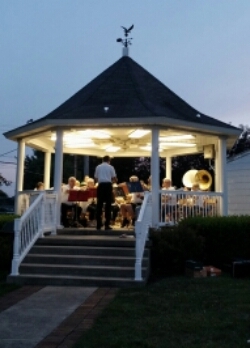 I walked up to the band and said ‘shhhhhh!’ Seriously, the noise was going right through my head. But did they listen? Of course not. They just kept playing and playing with little regard for how it was impacting me and my sensitive ears. ‘Shhhhh’ I tried again. The trombone player screwed up his nose at me. The violinist rolled her eyes. Then a young lady, who I’d never seen before in my life, appeared next to me wearing this big fuzzy white gown. Bill and I have travelled to some extraordinary places. We had dinner in Bangkok in the rooftop restaurant of the Banyan Tree Hotel, above the noise and the smog of the city below, and ate at a table for two with white tablecloths. We stood alone at the Byron Bay lighthouse at night and looked out into the dark blue sea from Australia’s most eastern point. We climbed the Statue of Liberty and gazed back at the city of New York on a clear winter’s day, rugged up in scarves and jackets. 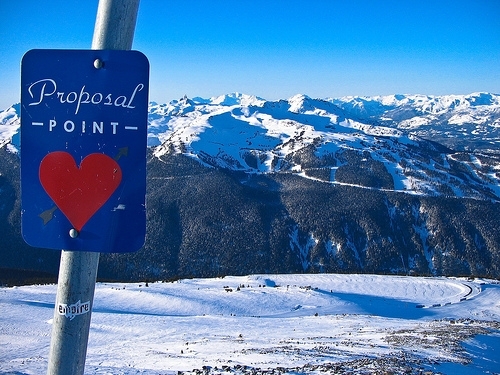 The perfect location for a romantic proposal (near Whistler, Canada). You see, when you’re approaching 30 and you’ve been with someone for almost a decade, you start to believe that a marriage proposal is lurking at every romantic destination. Excitement builds, you get sweaty palms, you have trouble breathing as you prepare the acceptance speech in your mind. Picks up a $2 coin. Takes a photo of New York from the lower perspective so he can ‘fit it all in’. I would let out the breath I’d been holding all morning. Bill, oblivious to my expectations would make a random comment about the view. This was how it went a thousand times over. Even at dinner on our 10 year anniversary when I was certain a proposal would happen he didn’t even order dessert, claiming he was tired and felt like an early night. So how did he do it in the end? How does a man top a thousand magical destinations and declare a lifelong commitment to his wife-to-be?